10 Things You May Not Know About BATMAN RETURNS | Warped Factor - Words in the Key of Geek. 1. After the phenomenal success of Batman in 1989, Warner Bros. wanted a sequel to get underway pretty quickly. They spent $250,000 storing the sets from the first film, and secured Pinewood Studios for May 1990 so the sequel could begin shooting. "I will return if the sequel offers something new and exciting. Otherwise it's a most-dumbfounded idea." Sam Hamm, who had written the first movie, was tasked with writing the first draft script, which Warner Bros presented to Burton. The storyline involved Penguin and Catwoman on the search for some hidden treasure in Gotham. Burton clearly felt it was "a most-dumbfounded idea" as he chose to direct Edward Scissorhands for 20th Century Fox instead! "...came up with a social satire that had an evil mogul backing a bid for the Mayor's office by the Penguin. I wanted to show that the true villains of our world don't necessarily wear costumes." The subplot of Penguin running for Mayor was actually inspired by the 1960s Adam West TV series episodes "Hizzoner the Penguin" and "Dizzoner the Penguin". "Sam Hamm definitely planned that. I flirted with it, having Harvey start to come back and have one scene of him where he flips a coin and it's the good side of the coin, deciding not to do anything, so you had to wait for the next movie." "When I was hired to write Batman II, the big problem of the script was Penguin's lack of a 'master plan'." Warner Bros. suggested that Strick have Penguin either warming, or freezing Gotham City, a plot point they would later use in Batman & Robin, but Strick found inspiration from the Bible of all places. He decided upon a Moses parallel that had Penguin killing the firstborn sons of Gotham. A similar notion was used when the Penguin's parents threw him into a river as a baby. 5. Robin was to feature in Batman Returns, and he was only cut out of the script just prior to shooting. In the early drafts Robin was to be a juvenile gang leader, who becomes an ally to Batman, but, for the sake of 1990s diversity, Robin was changed to a black teenage garage mechanic! "the most worthless character in the world, especially with [Batman as] the loner of loners." Plus the character could always feature in a third film. 6. 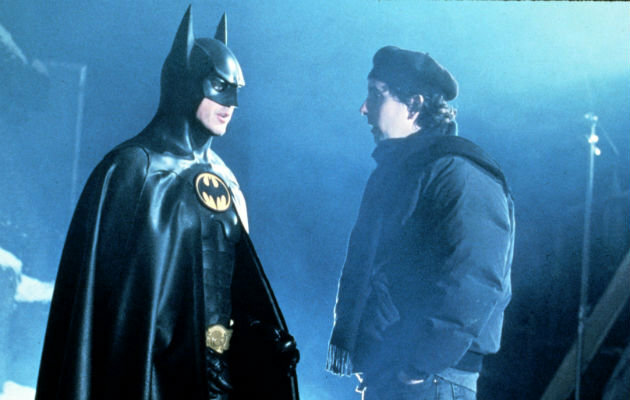 Like Burton, Michael Keaton held out on a return to Bruce Wayne/Batman, but was evetually won over by the director's return, a significant increase in his salary to $10 million, and the promise of a zipper put into the Batsuit's pants! 7. Annette Bening was cast as Catwoman after Burton saw her performance in The Grifters, but she had to drop out of the production when she became pregnant. Raquel Welch, Jennifer Jason Leigh, Madonna, Ellen Barkin, Cher, Bridget Fonda and Susan Sarandon were all then considered for the role. Sean Young, who was originally chosen for Vicki Vale in the previous film before being dropped for Kim Basinger, believed the role should have gone to her, and even turned up at Burton's office dressed in a homemade Catwoman costume, demanding an audition! Tim Burton revealed that he actually hid behind his desk so she couldn't see him. Burton later said that he was unfamiliar with Michelle Pfeiffer's work, but was convinced to cast her after just one meeting. Pfeiffer received a $3 million salary, $2 million more than Bening, and a percentage of the box office. 8. During an A&E Biography, Michelle Pfeiffer said that her Catwoman costume was vacuum sealed once she was fitted into it for scenes, so she actually had only a short amount of time to perform before she would have to have it opened or she could become light headed and pass out. Because of this technique the majority of the catsuits were not reusable, with Pfeiffer going through 60 of them during the production. The actress went on to say that once filming was over, she never wanted to see the costume again for as long as she lived. "I kind of knew that Danny DeVito was going to play The Penguin. We didn't really officially cast it, but for a short nasty little guy, it's a short list. I ended up writing the character for Danny DeVito." 10. 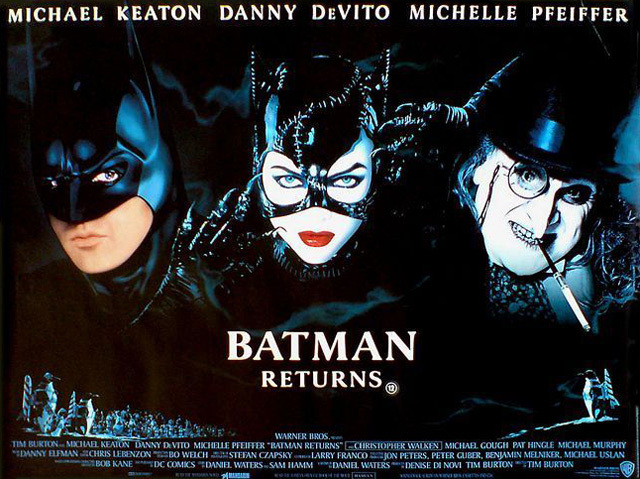 When the publicity began for Batman Returns, Warner Bros. had to constantly submit new Catwoman posters as they kept being stolen from bus stops and other prominent locations. It soon got so bad that police officers were asked to patrol bus stops in order to catch perpetrators before they could break the Plexiglas containers. Eventually Warner Bros. started to send out Penguin posters as replacements - none of them were stolen!